What should I mix into my strawberry nice cream? BALSAMIC DRIZZLE. What should go on my vegan Caprese panini? DUH, BALSAMIC DRIZZLE. What is the one thing in the world that makes fresh figs even more delicious. UM, HELLO?! BALSAMIC DRIZZLE. You see friends, whatever the question, the answer is nearly always balsamic drizzle. I’m also lucky enough to live near my landlord who has a dozen fig trees in her front yard. She says I can pick them whenever I want which begs the question, Why I am not doing this on a weekly basis? I could be eating arugula fig salad every day! The perfect simple salad for late summer. 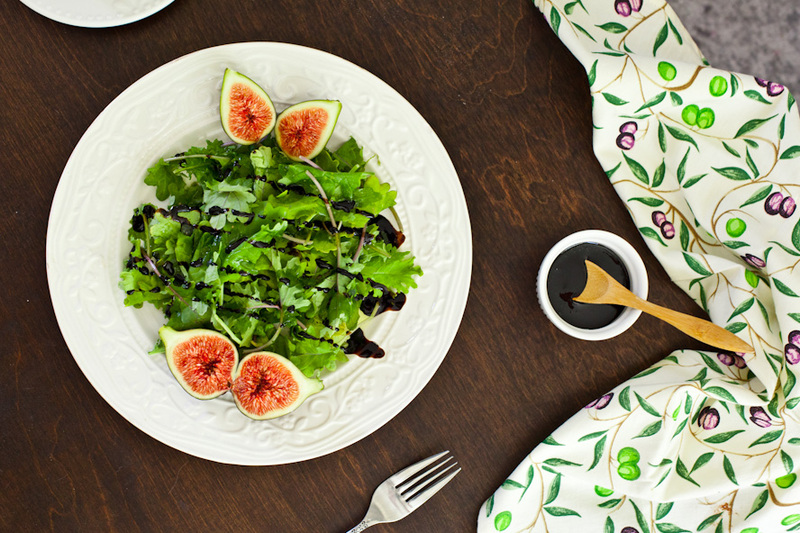 Enjoy juicy fresh figs before they go out of season with spicy greens and balsamic drizzle. Toss the greens with olive oil and gently massage it into the leaves. Add the green onion and optional walnuts. Cut the figs into thin slices and mix into the greens, setting a few halved figs aside to garnish the salad. Drizzle the balsamic reduction over the fig salad. Finish with a sprinkle of sea salt and freshly cracked pepper. We left the walnuts off for our nut allergy peeps but our arugula fig salad tastes amazing with a handful of them sprinkled on top. If you can, do it! If you are as obsessed with balsamic glaze as I am, be sure to check out our Raw Vegan Strawberry Ice Cream and our Strawberry Kale Salad. Did you try this arugula fig salad recipe? Leave us a comment and tell us all about it! Better yet, post a photo to Instagram with the #carrotsandflowers so we can admire your handiwork! To save this recipe for later, pin the photo below. Cheers!